Public-private partnerships (PPPs) serve as a critical tool for fostering infrastructure and economic stability throughout the world. Using this contract model, a government agency transfers a portion of its responsibilities and risks to a private-sector company or consortium as part of a long-term agreement to finance, build, and operate various infrastructure projects. PPPs have traditionally spanned multiple business sectors worldwide, including – but not limited to – water, power, public transportation, and beyond. In Gulf Cooperation Council countries such as the Kingdom of Saudi Arabia (KSA), Kuwait, and the United Arab Emirates (UAE), independent power and water projects have long been considered commonplace, dating back to the 1996 introduction of Oman’s first, 270-megawatt Manah power plant. Although GCC countries have successfully launched PPP projects since that time, concerns surrounding limited commercial appeal for private developers, insufficient legal and legislative frameworks for PPP had hindered widespread adoption of the model throughout the region. The tide seems to be changing, however. The PPP model has gained considerable traction in recent years, as falling oil prices and financial constraints have led GCC governments to seek funding from private investors for social infrastructure needs. Additionally, diversified sources of income – such as petrochemicals and renewable energy – have reduced dependence on oil in the region, further necessitating the need for increased PPP implementation. Therefore, to facilitate PPP projects, governments are increasingly implementing legal and legislative reforms to make PPPs more commercially appealing. Paired with rapid population growth, urbanization, and economic expansion, there has been an increasing and vocal demand for new projects, specifically in the realm of social infrastructure. Housing and healthcare projects, for instance, are a natural fit for the public-private model. And thanks to a steadily expanding youth population, one social infrastructure sector in particular is emerging as a prolific beneficiary of Public-Private Partnerships: education. In 2016, Crown Prince Mohammed bin Salman launched Saudi Arabia’s comprehensive Vision 2030 plan. Instituted as a means of reducing the country’s dependence on oil and diversifying the economy, the plan emphasized the development of public service sectors such as health, tourism, infrastructure – and education – via increased participation from private developers. As part of this movement, the National Transformation Program was created. Operating across 24 government bodies, the program serves as a road map, linking strategic objectives set forth by Vision 2030 to interim targets in the year 2020, with one of its focuses being education. In a groundbreaking move, in January 2018, the Ministry of Education (MoE) in the Kingdom of Saudi Arabia (KSA) announced a tender for private companies to build and maintain a total of 60 schools in an effort to relieve pressures on state finances. The limited-liability, state-owned Tatweer Buildings Company (TBC) had specialized in the management of government projects since 2013; specifically the design, construction, and implementation of school buildings and their support facilities. TBC invited expressions of interest as part of the tender. An RFQ was released in March of 2018. The submission of prequalification documents by bidders followed shortly thereafter for the construction of kindergartens and secondary schools in the cities Jeddah and Makkah. An RFP is expected to be issued following the announcement of prequalified bidders. This landmark partnership – one of the first in the Education Sector in KSA – is expected to serve as a barometer, of sorts, in determining the success of such strategies in the future, and to gauge the level of interest among investors. United Arab Emirates, 2007: the Mubadala Development Company took part in that nation’s first – and, at the time, largest – single education project with the construction of UAE University. The development sparked a movement, and the Paris-Sorbonne University Abu Dhabi and Zyed University projects were completed in each consecutive year. Since that time, the UAE Department of Education and Knowledge has continued to pursue the participation of private contractors for education and administrative purposes. In Kuwait, pressure has been building over the last several years for the development of better education facilities, with the country’s population expected to increase at a compound annual growth rate (CAGR) of 2.8% per year throughout 2020. In 2014, the Ministry of Education turned to the private sector, developing the Kuwait School Development Programme to stem the tide. Under the program, nine schools – 5 kindergartens, 3 elementary schools, and 1 middle school – in addition to a residential building for faculty, and an Olympic style swimming pool, were outlined. These facilities, to be located near Kuwait City, are expected to have a capacity for 4350 pupils. As an independent global Financial Advisory firm, Synergy Consulting regularly works with clients across multiple social infrastructure sectors, including healthcare and education. We provide services in the areas of transaction advisory, project structuring, project finance, financial analysis, mergers & acquisitions, commercial and financial due diligence, and restructuring. 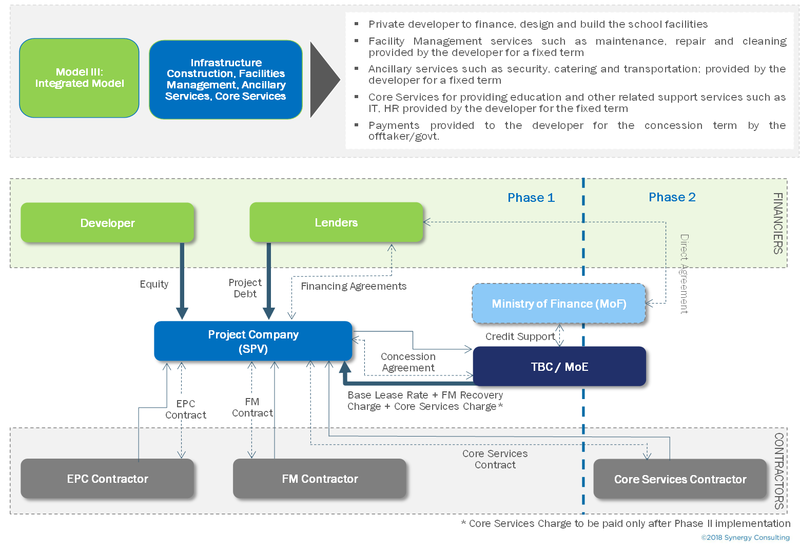 In this basic model, a private developer finances, designs, and builds the school facilities, which are then leased back by the government for a fixed term of 20, 25, or 30 years. 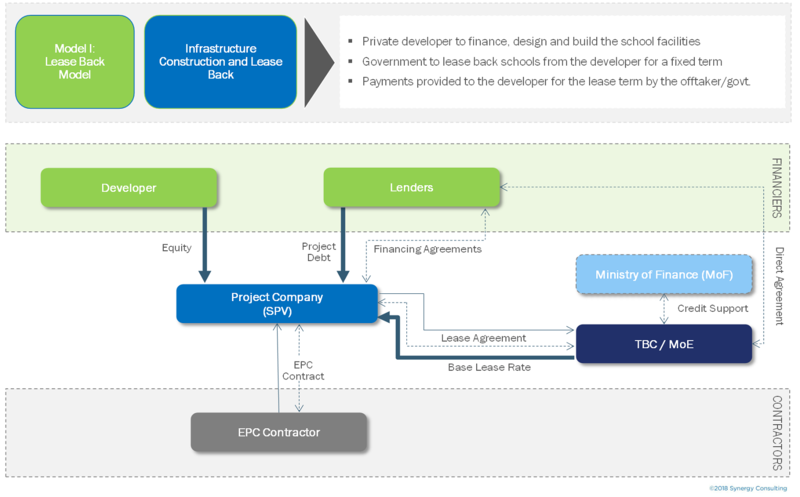 Payments are provided by the government to the developer for the duration of the lease. Below is a structural representation for Model I. 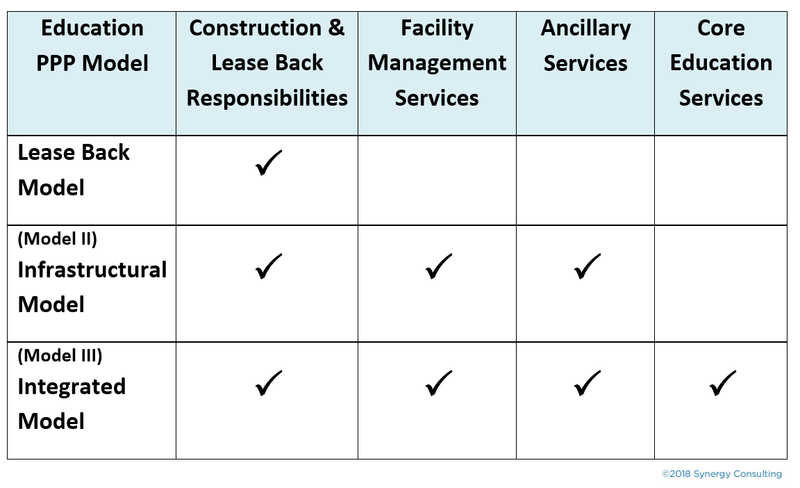 The Infrastructural Model includes all services outlined in the Lease Back Model, in addition to Facility Management Services provided by the developer. These services may include routine maintenance, repairs, and cleaning, for a fixed term – with the option to also provide ancillary services, such as security, catering, and transportation. A Facility Management Recovery Charge is paid by the government for the concession term. Below is a structural representation for Model II. The third and most comprehensive model calls for the developer to provide all services outlined in the Infrastructural Model, in addition to Core Education Services, which may entail teaching, study materials, and related support services including IT and Human Resources. These, too, will be provided by the developer for an additional Core Service Charge, payable by the government for the concession term. Below is a structural representation for Model III. Myriad benefits impacting developers, government agencies, and the population at large stem from the adoption of educational PPPs throughout the GCC. Fiscal – By pursuing private development, government agencies can reduce public costs while significantly expanding their infrastructure. Quality – The quality of both infrastructure and educational support via the PPP model typically exceeds that which government agencies can provide – and is often equivalent to world-class facilities. Scheduling – Public-Private Partnerships are notable for being completed on-time, if not ahead of schedule. Additionally, the potential for profit generation and reduced debt accrual provides added motivation for a strict adherence to timetables. Risk-sharing – When properly structured, PPPs allocate risk to the party most equipped to handle it. It is important to note that PPPs in the education sector are intricate, long-term contractual relationships. Their success is directly related to a number of diverse factors – including shared responsibilities, risks, and rewards – and flexibility between both private and public sectors remains a critical factor influencing results. Model structure implementation and developer participation will ultimately be determined by the way in which the following best practices and considerations are structured. Bundling for education PPPs, which is typically based on geographical spread and suitability, with average package sizes totaling 60 to 80 schools. These projects should ultimately derive benefits from common sourcing and economies of scale, such as labor mobilization. A Security Package providing credit support for ongoing payment obligations and termination payments to the private developer. A Single Concession Agreement implemented for all schools including a partial termination option for the failure to meet construction or operation period Key Performance Indicators (KPIs). Third Party Monetization providing an additional source of revenue for the developer, as school facilities may be utilized by outside vendors during after school hours and vacation times. Management Services providing maintenance for issues related to health and safety, service failures, and unavailability. Additional services including repairs (for furniture, communication, tech, and more), security during school hours, and ancillary services such as catering and transportation. Approvals including land-related approvals, which are the responsibility of the releasing government authority, as well as construction or operation-related approvals, which are the responsibility of the developer. Key Performance Indicators (KPIs) concerning construction and all subsequent services which must be finalized and agreed upon, and a method established for monitoring them. Hand Back Requirements which are finalized and agreed upon regarding requirements for the transfer of schools and all related documentation at the culmination of the concession term. While many Public-Private Partnerships have taken shape throughout the GCC over the last decade in business sectors including energy, water, and housing, utilizing these models for educational purposes remains an emerging concept in the region. 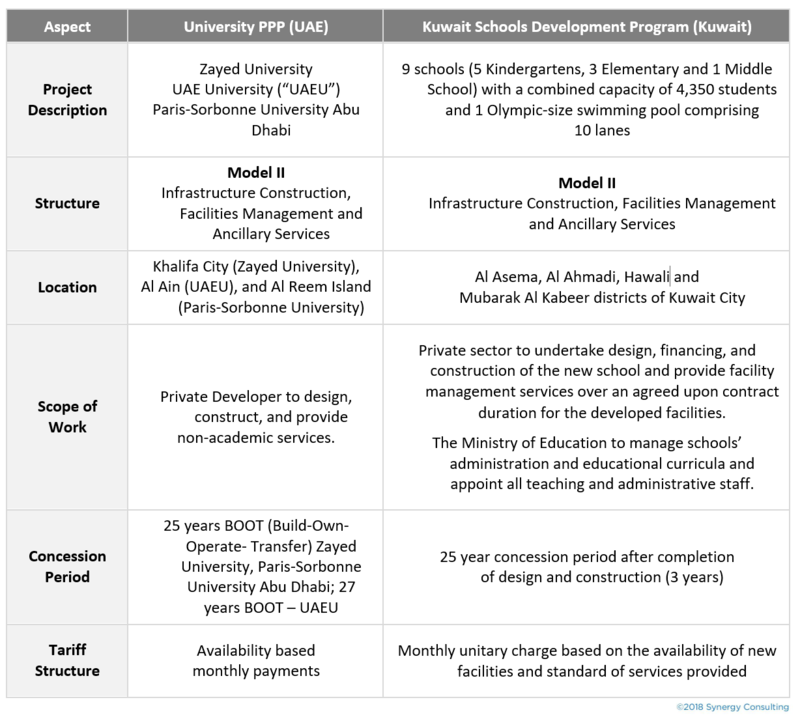 The following table outlines the distinct services to be provided by the developer in each of the three potential model structures for educational PPPs. 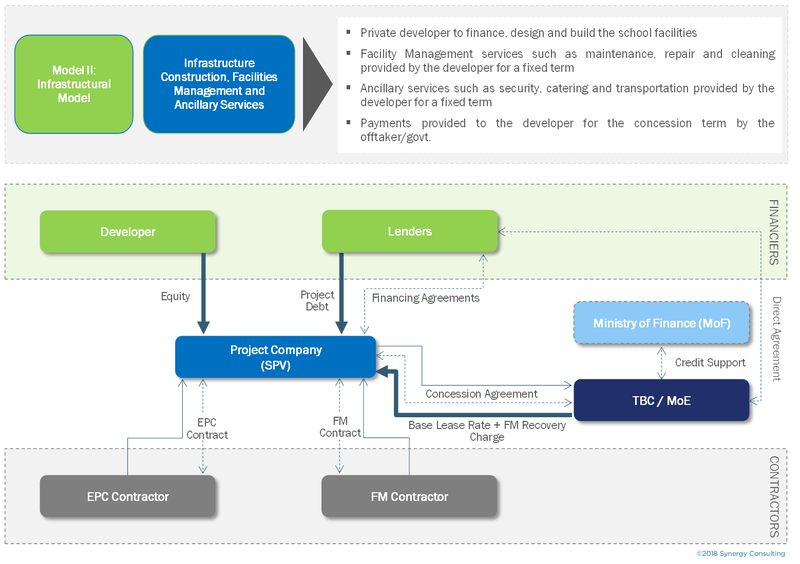 Through this model, ancillary and Facility Management services shall be provided by the private developer who – having spearheaded the school’s construction – shall have an intrinsic knowledge of the facility’s unique needs and shall be best equipped to provide for them. Synergy Consulting, Inc., works closely with its clients at various stages of project development to understand their financing needs and requirements and help them make informed decisions. Our specialists are currently available for consultation with developers seeking to respond to a Request for Proposal for the Tatweer Buildings Company’s schools project in the KSA. To learn more, please reach out to us at https://www.synergyconsultingifa.com/contact/. Synergy Consulting Infrastructure and Financial Advisory Services Inc.